jQuery or PHP preferred or just any useful information on this. I know I'm very late to the game, but thought I'd contribute for posterity's sake. I wrote a short jQuery function that will automatically turn any <address> tags into Google maps links. Use a + instead of any space. Put a comma , in front and behind the city. Include the postal/zip and the province/state. Replace any # with nothing. 4 Then put a slash at the end. NOTE: The slash at the end was important. After the user clicks the link, Google goes ahead and appends more to the URL and they do it after this slash. In the top left corner, click the main menu ​☰. At the top of the box that appears, choose the Embed map tab. Choose the size you want, then copy the code and paste it into the source code of your website or blog. Note: If you're using Maps in Lite mode, you won't be able to embed a map. Keep in mind that traffic information and some other Maps info might not be available in the embedded map. I used it for a few applications I've designed and it worked like a charm. Remember to replace the first and second addresses when necessary. I had a similar issue where I needed to accomplish this for every address on the site (each wrapped in an address tag). This bit of jQuery worked for me. It'll grab each <address> tag and wrap it in a google maps link with the address the tag contains contains! It produces valid markup (Mr.Hendershot's solution creates <a><address></address></a> which is invalid because block-level elements such as <address> are not permitted within inline elements such as <a>. Then it'll work just fine. You can use that to create specific rules that meet GM standards. 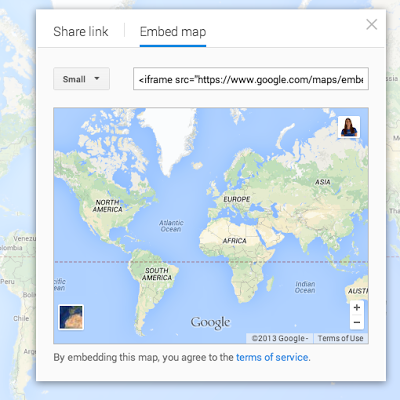 I just found this and like to share..
click "shared or embed map"
click the short url checkbox and paste the result in href..
Not the answer you're looking for? Browse other questions tagged google-maps hyperlink google-maps-urls or ask your own question.